When a national touring band receives widespread recognition for their hard work, it's confirmation that their music has reached a level only some can measure up to. For Greensky Bluegrass, the time has come to honor the band for their dedication and relentless pursuit of award winning music. Many in the business are starting to recognize this young band from Kalamazoo Michigan and the guys with GSBG deserve every minute of it. Since forming in late 2000, the band has been on a steady rise to stardom and playing more than 150 shows a year. 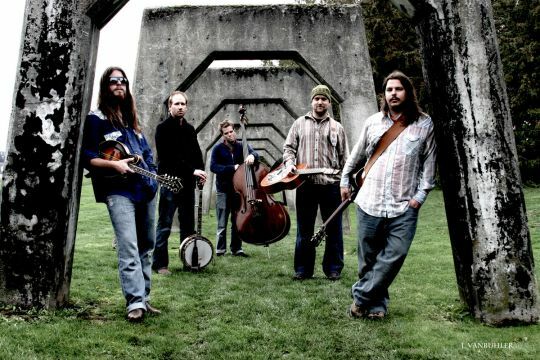 Greensky Bluegrass has the right formula for success with music that is inspirational, upbeat and heartfelt. Wrapped between eloquent vocals are fast paced solos and soaring melodies that will get crowds dancing and screaming for more. Their songs tell stories, create emotions in the delivery and rival their counterparts in the genre. On mandolin is Paul Hoffman who not only shreds with his instrument, but also has great stage presence. Paul’s humor between songs is witty and natural. He has lifetimes ahead of him and it is a pleasure watching him play. On banjo is Michael Arlen Bont who is talented with his instrument and lends a huge dynamic to this band. On bass is Michael Devol who replaced Chris Carr in 2004. Devol is always in the pocket and a nice addition to this lineup. On guitar is Dave Bruzza, a natural bluegrass musician who has great singing abilities, amazing chops and a prominent voice in the band. On dobro and the heart and soul of the band is Anders Beck who is flawless with his playing. Beck replaced Al Bates in 2007 and a shining star in the making. Beck can play as good as Jerry Douglas and a real treat to see. The band’s new album Handguns is now partially available online and an amazing production from beginning to end. Check out the band's website for download information: www.greenskybluegrass.com Each song has eloquent harmonies, meaningful lyrics and ones you could listen to over and over again. The title track has that Colorado, Rocky Mountain, Country-twang to it, but bluegrass in the traditional sense of the word. The song Cold Feet should be winning awards with its grace and compassion. The harmonies and melody could scare away the blues on a cold day and one of my favorites. Greensky Bluegrass is turning up around every corner and getting asked to play some of the big festivals around the country. This October the band has been asked to play Hardly Strictly Bluegrass in San Francisco. To be even considered for that festival is a huge feat and the men of Greensky Bluegrass have to be relishing in the glory. With a sound like Alison Kraus & Union Station, Sam Bush and Yonder Mountain String Band anything is possible. This is definitely a band to watch out for in the coming years as they hit the big time and capture audiences all over the country. At Moe’s Alley in Santa Cruz, I spent a few minutes with Mandolin player Paul Hoffman about their current tour and the new album being released at the end of the summer. It was one of those “off the cuff” interviews, totally spontaneous and unplanned. The guys were playing with Poor Man’s Whiskey, an amazing double-bill with talented musicians and stellar music. Where have you guys been this summer and what part of the tour is this? We are in the middle of the tour and it’s been a crazy run. We left Michigan to drive to upstate New York and then turned around to play the All Good Music Festival for two days on the way to Portland before the String Summit. So, we did 4000 miles in the first seven days. Now, we are on the club portion of the tour half way through 14 days which ends at Yarmony Grass in Colorado. Then we head back home. Are you noticing momentum, seeing crowds consistently and feeling the energy from audiences across the country? We are definitely feeling it and can quote a famous cliché, “Hard work pays off”. It is starting to come up more often, but club shows vary. Some are strong and some aren’t, that’s just the nature of the business. You are subject to a lot of variables which can determine the amount of people coming out. But, we are starting to get a lot of attention from festivals, higher placement and higher priority. We have been given an amazing opportunity to play some great slots at these festivals. At The Northwest String Summit, we did their first ever Thursday night show with Yonder playing the whole weekend. We played the evening before and people are more inclined to come to that rather than the afternoon slot when people are just rolling in and setting up camp. We have definitely felt it with great energy in rooms and bigger crowds. We have been through the west coast a few times starting in 2006 when we played The Connecticut Yankee; we even stayed at Fritz’ house. Now, we are playing bigger venues like Slims and The Independent. It seems like our momentum has been spreading down the coast beginning in Portland and coming into California southward. Seattle is starting to come through for us with sold out shows and great crowds. Has the lineup in the band changed from the beginning? Did all the guys playing tonight come from the initial group? There are three of us who met about 10 years ago and started playing as Greensky Bluegrass. We did open mic’s and parties, learning how to play instruments because we were all beginners. Then we added our bass player in 2004 and that’s when we started touring. I guess you could say that year marks the seriousness and beginning of the band. Not to say we were never paid for gigs touring the west coast of Michigan. But, in hindsight it’s nothing compared to this; all the weekend warrior kind of stuff, but always as Greensky Bluegrass. Then we met Anders along the way, he joined the band in 2007 after playing with the Wayward Sons. We have definitely grown over the years, but never lost anyone. 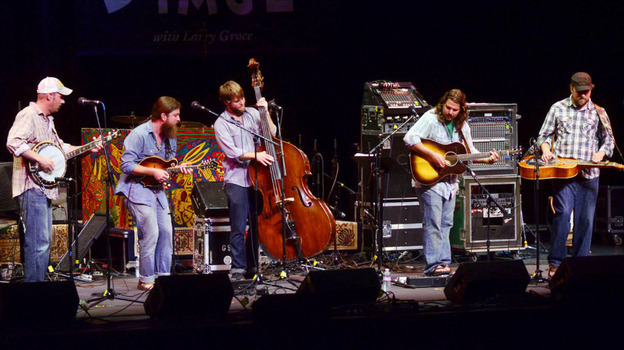 What is the significance of the name Greensky Bluegrass? I think it was a joke at the time, like a good bluegrass name should be. It’s funny that the genre has more play on word pun use than any other genre. Maybe it has something to do with the name bluegrass being ridiculous and funny. 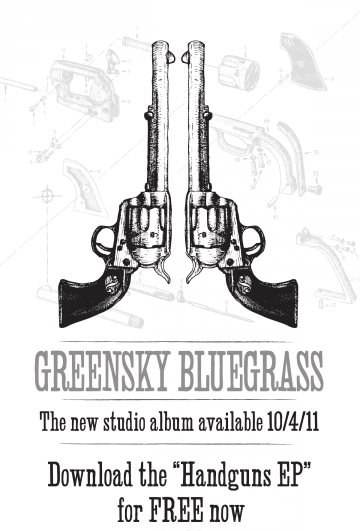 There is Blueground Undergrass, Green Montain Grass and Greensky Bluegrass. Tell us about discology and albums over the last few years. We are just about ready to release our fourth studio album Handguns the week after Hardly Strictly Bluegrass. Starting this week though, we will give half of the album away for free on our website. We are in the final stages of getting that ready for everyone and hard copies will be available on October 4th. We can’t wait that long until the fall to release the album and want give fans a little taste. We have a couple live releases as well called “All Access” and there were two of those. You can get them on iTunes and livedownloads.com. It sounds like you guys have a busy summer, capping it off with festivals and an album coming out. You have made a name for yourselves and touring the country. What if anything is missing in your life with a year filled with greatness? We get tired being away from home. We have significant others and it’s hard having this commitment. At first it’s really exciting, but then it starts to wear on us. Yesterday, coming into San Francisco I was lying down and knew exactly what the guys were talking about without seeing what was out the window. I realized that going across the country is our job and we are so lucky to have that opportunity. We often talk about larger, more comfortable vehicles. But, the reality of the world and the prices of gasoline make that a big challenge. 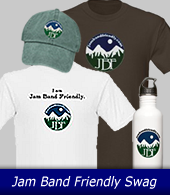 I hope you guys have a great year, Jambandfriendly wishes you a lot of luck and supports Greensky Bluegrass.